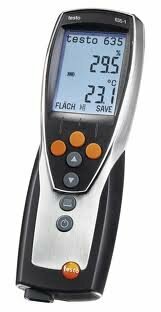 The instrument for measuring air moisture, material equilibrium moisture and pressure dewpoint in compressed air systems. Moisture characteristics can be recorded in the instrument memory and analysed and displayed in graphics or tables. Up to 3 temperature or humidity probes can be displayed in the 635-2AA meter; data transmission is by radio i.e. wireless. Selectable user profiles, i.e. allocation of specific function buttons and menu-guide to an application enable intuitive operation. Material moisture can be displayed immediately on account of the special probe. Characteristics for different materials can be stored in ComSoft and transmitted to the instrument. testo 635 immediately displays the dewpoint difference between ambient air and the wall surface in the analysis of moisture on walls and ceilings. Precision probes up to -60°C tpd are available to check pressure dewpoint in compressed air systems. The humdity sensor developed by Testo has proven itself worldwide and has outstanding features in terms of precision, long-term stability, temperature resistance and robustness.